The Farmer's loop is a knot which forms a fixed loop. 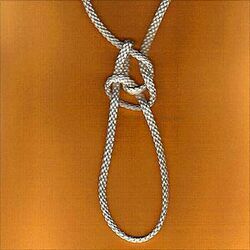 As a loop-on-the-bight, it is related to several other similar knots, including the Alpine butterfly knot and Manharness knot. Cornell University professor Howard W. Riley published this knot in a "reading course pamphlet" devoted to farming knots in 1912. ↑ Clifford W. Ashley, The Ashley Book of Knots (New York: Doubleday, 1944), 191. This page was last edited on 30 March 2007, at 22:25.